The next time you visit the museum, you’ll notice that we’ve recently renamed our lobbies as the Lancaster Street and Salisbury Street Welcome Centers. We’ve also taken this opportunity to change the Visitor Services Department to our Guest Services Department. The next time you visit, stop at our admissions desks in either of our Welcome Centers and ask a member of Guest Services why we renamed them. Their answer—and mine—is that the most important transaction that takes place upon entering or exiting the museum is the welcoming experience. 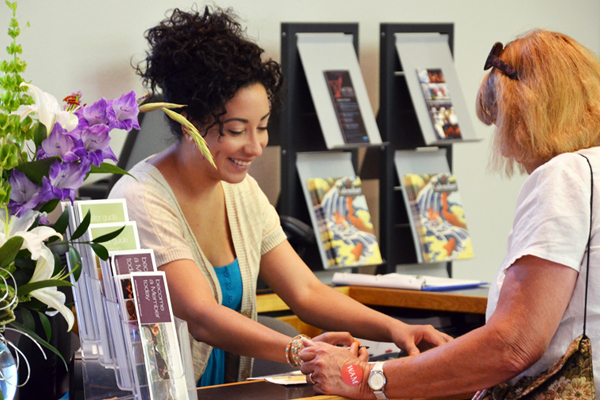 How important is it for you to be warmly greeted and welcomed to the museum? Our customer service begins with hello, but quickly can become an answer to your important question, directions to a specific work of art, or timing for a program or other offering. We hope to create a welcoming experience and what we hope will be a transformative museum visit. When we think of the word, guests, we think of a loved one or a friend who is coming from out of town and visiting.How do you prepare your home for your guests; what might you do differently? Being our guest signifies your role as a member of our community, of well acquainted neighbors and friends, not just someone who stops by. While changing what we call our lobbies and services does not dramatically alter the museum, hopefully it signifies a step in our commitment to you as our guests. Our goal is to continually make the museum a better place for you.